The Indus Hospital has become the only health facility in Karachi to use minimally invasive technique to treat osteoid osteoma (bone tumor). A team of radiologists lead by Dr Kashif Shazlee, Chair Imaging Services, Indus Hospital, Karachi recently performed Microwave Abalation Procedure on two young patients to treat the benign tumor of the bone. 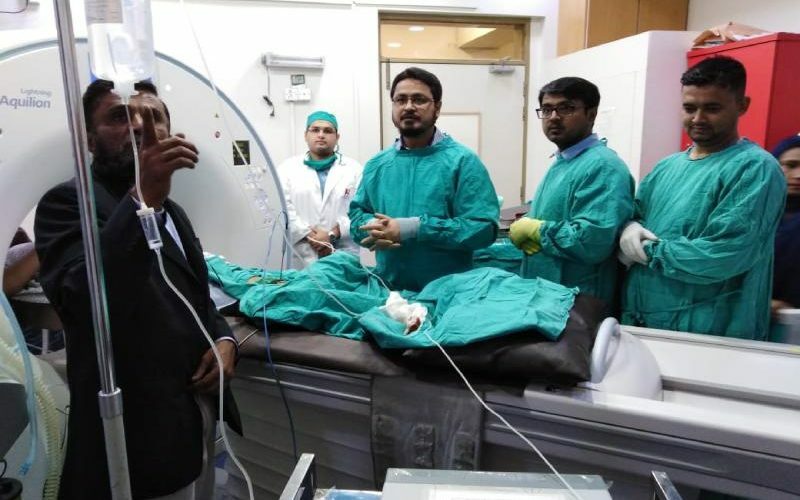 “Using this technique tumors are burnt with high-energy radiation without any surgical procedure”, said Dr Kashif Shazlee. The treatment is based on a new technology, known as Microwave Ablation (MWA), which destroys tumours using heat generated by microwave energy. During the treatment, the radiologist first insert a small laparoscopic port or open incision to gain access to the tumour. A CT scan or ultrasonic guidance is used to pinpoint the exact location of the tumour. A thin antenna, which emits microwaves, is then inserted into the tumour. The probe produces intense heat that destroys tumour tissue, often within 10 minutes. Microwave ablation is now the gold standard for the treatment of liver, kidney, thyroid and bone tumours, and cancers. It has a number of advantages compared to surgery or traditional radiofrequency ablation. It is much faster than surgery and other methods, it can simultaneously ablate several tumours at the same time while through this technique, tumours larger in size can also be dealt with, without any complication. With its state-of-the-art facilities Indus Health Network aims to introduce many such minimally invasive procedures at its network of hospitals across Pakistan.